QCSe2-500 produces up to 500 slices per hour. QCSe2-800 produces up to 800 slices per hour. QCSe2-600H with a 3" high opening produces up to 600 slices per hour. Large LED display provides for easier reading of settings. Single order feature allows darker or lighter for one time product orders without the need to change program settings. Quartz infrared heaters provide faster, more consistent heating than traditional heating elements and responds quickly to the electronic control. Compact - requires only 14-5/8" of counter space and the forced convection system allows the unit to be placed against a wall. Other toasters have louvers requiring additional counter space. Customize your settings for your specific product needs with our easy programmable electronic control. Once the control is programmed the setting will automatically default to the last saved setting. Holman’s forced convection keeps the toaster cool to the touch and extends the life of critical components. The forced convection increases productivity by re-circulating pre-heated air into the toasting chamber. Super energy efficient with programmable feature allowing the operator to set stand by feature automatically from 1/2 hour to 8 hours: This feature will automatically reduce power by as much as 100% (power reduction can be reduced in 10% increments) if toaster is not in use after a pre-programmed set time. Holman’s easy to use electronic control panel takes the guesswork out of temperature and speed control settings for your bread products. The electronic control is pre-programmed from the factory with 4 channel settings for toast, bagels, English muffins and other. Change products on the go with the touch of a button any time during the operation. Mistakes are minimal with preset channels for consistent toasting. Electronic controls are perfect for foodservice operations and restaurants with inexperienced staff. This state of the art toaster is designed for a variety of bread products such as bagels, English muffins, toast, buns and more. Holman’s new QCSe2 is the ultimate in conveyor toasters with touch pad electronic controls for consistent toasting and easy operation. The innovative cost reduction features can provide significant energy savings and longer component life with a simple touch of a button. Toasters are furnished with 1" adjustable legs and 4’ cord. 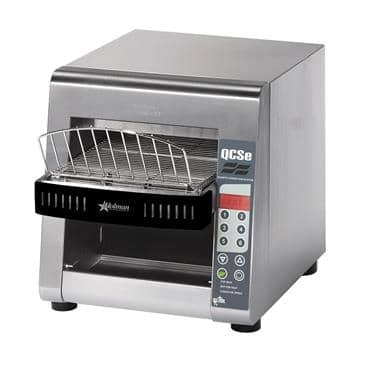 Star’s Holman conveyor toasters are covered by a one-year parts and labor warranty. Conveyor toasters are constructed of corrosion resistant stainless steel. Supplied with heavy-duty motor, drive chain and fast heat up quartz infrared heaters. A conveyor belt tension system is supplied for a smooth, quiet operation. Units are supplied with digital programming for variable speed control, top and bottom heat control, power saver and high limit switch. Extended conveyor belt, crumb tray, heated holding area and full width burn guard are standard. Unit has a one-piece cover for easy access with 1" adjustable legs and a 4' cord. Units are listed with UL, CUL and are UL certified to NSF4. Printed in the U.S.A.